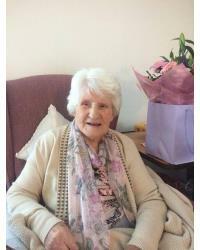 McCULLOUGH (Downpatrick) (nee Ross) Eileen R.I.P. Died April 11, 2019 peacefully at her daughter's residence. Dearly beloved wife of the late Patrick John and loving mother to Mary, Noelle and the late Martin, Kevin and baby Anne. Dear mother-in-law to Chris, Jim, Pauline, Anne and Perpetua. Cherished grandmother and great grandmother. Funeral from her late residence, 93 Ardmeen Green, Downpatrick on Saturday April 13th at 9.30am for 10.00am Requiem Mass in St Patrick's Church, Downpatrick. Interment afterwards in St Patrick's Cemetery, Killough Road. All enquiries to Seamus Fitzsimons Funeral Directors (028 4461 2563). I am sorry to tell you that Eileen McCULLOUGH has passed away.